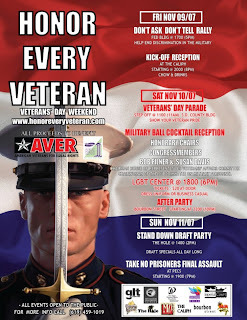 I received a nice email from Ben Gomez from the American Veterans for Equal Rights which in part notified me of events his organization is sponsoring this weekend, from a rally for the repeal of DADT to various receptions and get-togethers. If you happen to live in or near San Diego, CA you may wish to check out this page for more information. I wish I was able to go myself as it sounds like fun and I have many fond memories of San Diego during my time at NAS North Island.